Click here to watch the Matt Savage Marching Percussion Camp promotional video! The 16th Annual Matt Savage Marching Percussion Camp is a week filled with intense learning, fun activities, and the making of new friends from throughout the Carolinas and beyond. This year's camp will be held at a new location at beautiful Camp Pine Hill, a beautiful retreat nestled in the woods just south of Rockingham, NC near Bennettsville, SC. We are very excited that all cabins at Camp Pine Hill feature air conditioning as well as bathrooms and showers in every cabin! The facilities also include a large air conditioned meal hall, a swimming pool, great shady spots, a lake and large open field for our performances. The focus of our annual camp is rudimental drumming, marching percussion and "pit" percussion. 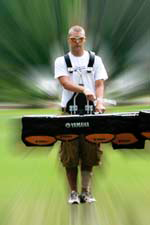 This is accomplished through a highly structured curriculum unlike that of any other percussion camp in the nation. The camp philosophy and curriculum will be based on a camp Matt Savage has taught in Oregon, with Alan Keown, since 1989. It is a time tested and proven approach that makes this camp one of a kind! The #1 goal of the camp is of course to improve drumming and musicianship skills but there is also a strong focus on developing life skills, a strong work ethic, meeting and getting along with new people, respecting each other, and making good life choices. We like to say that after attending this camp, every student will be "changed" for the better. Download registration and other forms from the downloads page. $345 due at camp check in. This includes improved refurbished cabins with AIR CONDITIONING, BATHROOMS AND SHOWERS IN EACH INDIVIDUAL CABIN!!! The cost also includes meals, instructional materials, drum sticks and camp t-shirt. The camp will be just as valuable to your top players and section leaders as it will for younger, less experienced players to improve or move to another drum in the fall. Check in will take place at Camp Pine Hill's Dining Hall between 5:00 pm and 6:30 pm on Sunday.